Alok Mishra is a poet, author, philosopher and Book Promotions specialist. He is the founder and Editor-in-Chief of Ashvamegh International Magazine and ILN - Opinion platform. He reviews books. 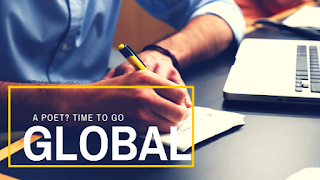 Go Global if you are a poet! Poetry has become very popular, once again, at least for the poets who write poems... Yes, there were many reports in the Western Media about the decline in readership of poetry. However, what they missed was the point that 'poets were emerging' despite the readers' crisis. And eventually, as the poets and poetry kept coming, the readers also joined the rally. Today, once again, poetry has become popular. There are many poetry magazines spread across the world. Some are online and some are offline and some are running on both the platforms. Online poetry magazines have the advantage of reaching out to the global poets' fraternity because the internet has become a household thing today. A poet writing in Virginia can send poems to the magazine being run by Indian person. Likewise, poets from India can also send their submissions to various magazine worldwide! This global exchange of verse has made poetry 'global' finally. We are witnessing a transition in reading as well as writing habits and so, the transition in publishing habits was inevitable. We read poetry anthologies today on Kindle devices and other ebook readers. The sale of physical poetry books has certainly declined, one cannot juxtapose that fact. How to choose the best poetry magazine to get your work published? This is the biggest question that pops up whenever a poet finishes writing some 5-10 poems. Well, you can take the help of internet and find on google. The popularity of a magazine publishing poetry can be measured by the level of poets published. For example, there is the Poetry Foundation website which is by far the best poetry resource for the readers as well as the writers. One can easily learn about different poets from the past as well as the contemporary world literature on that website. Coming to our country also, there are many poetry magazines in India publishing online or offline. Choosing amid various of them might be difficult, but Sahitya Akademi's journal remains far ahead of the competition... Getting published in some of the ezines will help the poets in getting noticed - their work, as well as their writings, will catch the attention of many readers. So, don't wait, and go global if you are a poet! (C) Content on this site are the property of website owner. Prior to reproduction, take permission. Picture Window theme. Powered by Blogger.